MagneGas Corp. (or “the Company”) is an alternative energy company that has developed and commercialized a patented plasma arc technology platform, Plasma Arc Flow®, that converts certain renewables and liquid wastes into hydrogen-based fuels. Using its novel technology, MagneGas is bringing a new, clean-burning fuel to the metal cutting market as a faster and safer replacement to acetylene. The Company’s tests have shown that use of its MagneGas2® fuel results in significant advantages in flame temperature, cutting speed, safety, environmental impact, and costs, when compared to alternatives such as acetylene. MagneGas’ market strategy entails three key sales channels: (1) a distribution network, both independent and wholly owned; (2) equipment sales with technology licensing; and (3) special markets, such as military and first responders. The Company has cultivated a list of customers and partners that include the U.S. military, several fire departments (including in New York City), several of the largest utilities in the U.S., and one of the world’s largest auto manufacturers. In addition, MagneGas’ fuel is in use in multiple high-profile construction projects, including NASA’s Kennedy Space Center build-out and two major amusement parks in Florida. 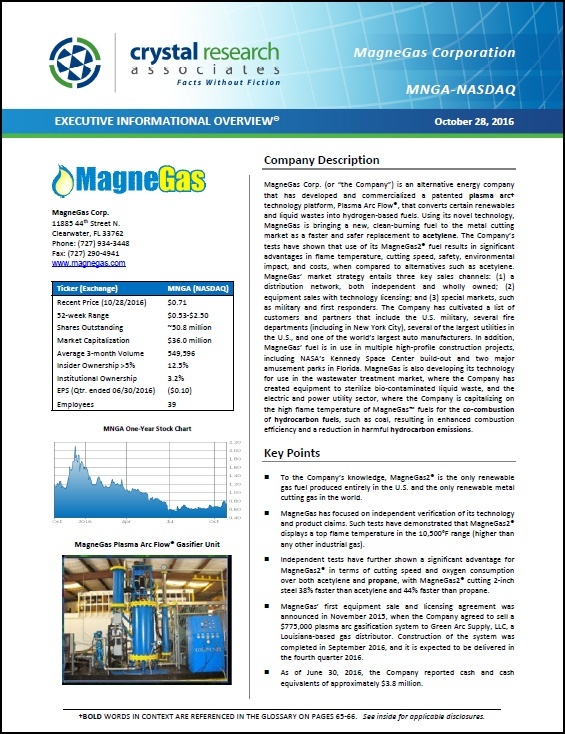 MagneGas is also developing its technology for use in the wastewater treatment market, where the Company has created equipment to sterilize bio-contaminated liquid waste, and the electric and power utility sector, where the Company is capitalizing on the high flame temperature of MagneGas™ fuels for the co-combustion of hydrocarbon fuels, such as coal, resulting in enhanced combustion efficiency and a reduction in harmful hydrocarbon emissions. * The Corporate Snapshot was last updated on October 28, 2016.